Chuck's legal career began at University of Dayton School of Law (UDSL) where he received his law degree with a concentration in Intellectual Property with honors. Prior to joining Wood, Herron & Evans, Chuck clerked at Wright-Patterson Air Force Base in the Air Force Materiel Command Law Office - IP division for two years. Chuck currently lives in Dayton, OH with his wife, Ashley. Chuck's primary practice area is IP litigation but he is also involved in patent and trademark prosecution. Chuck was admitted to the Ohio Bar in 2018. 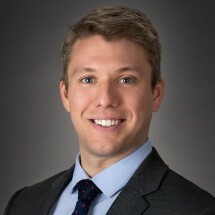 He is certified to practice in front of the United States Patent and Trademark Office after having passed the USPTO Patent Bar Exam in July 2017. Prior to attending UDSL, Chuck graduated from Xavier University in 2015 with a degree in Biology and Biological Sciences. Chuck is a member of the American, Ohio, Dayton, and Cincinnati Bar Associations and contributes as a volunteer consultant to the Dayton Development Coalition. Chuck is also a member of the Dayton Intellectual Property Law Association (DIPLA) and the Cincinnati Intellectual Property Law Association (CincyIP).